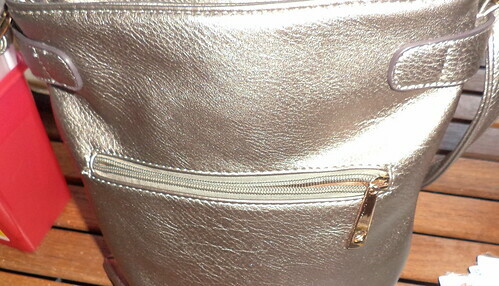 I had come to believe I would search, in vain, for a reasonably priced purse that provided the storage space I wanted. I had almost convinced myself that I would need to fork out upwards of $50 or $60 to get something that met my needs. It was so painful to contemplate that I continued to use the $20 purse I got at Penney's last year that really irritated me the longer I used it. After one particularly trying incident, where I couldn't find anything which had fallen to the bottom, I nearly chucked it then and there. "Why did I buy this?" I'd ask myself and then I'd remember that, at the time, it seemed like just what I wanted. The one reason for going to see Carole at the end of October was to be at my clan's tent at the Central Virginia Celtic Festival and Highland Games. It's held in Richmond in October and, with Carole living close by, I have no excuse not to go. The festival is huge and we had a fantastic time. The best part? Look what I came home with. We had passed by this tent on the way to the Clan Thompson tent. I didn't really give it much of a look, figuring I'd stop by later. Carole went there first and came back with a new purse. It was lovely so I had to go look. To quote Irving Berlin, "Heaven. I'm in heaven. And my heart beats so that I can hardly speak." 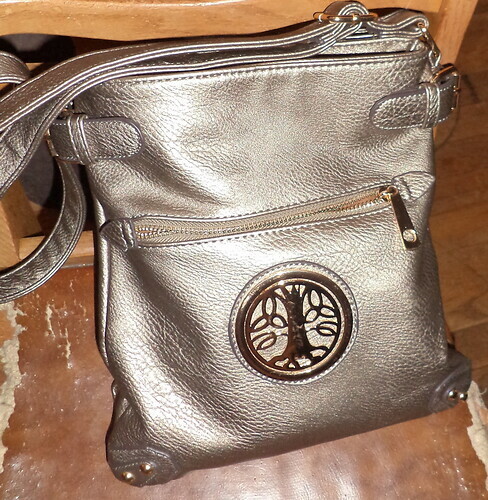 It's a bronze color, heavy duty, shiny leather purse. The emblem on the front could be changed to one of three designs, all Celtic-themed. The pocket in the front is where my cell phone goes. This pocket, on the back, is where my camera and any large coupons, like ones from Hallmark, or my shopping list, go. Look at the pockets! That is what sold me. The top pocket is the front. I keep my wallet there. What you can't see are two small side pockets where I keep my key ring with my loyalty cards, the extra Jeep key and a pen light. The bottom pocket, the back of the purse, is where I keep pens, hand lotion, a comb and temporary items I might need for the day. 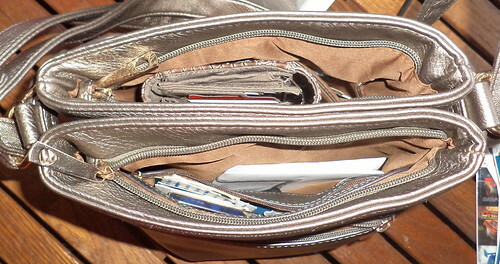 There is a large zippered pocket where I keep identification and photos and other small paper items. In between the two halves is a pocket where I keep cough drops and a plain pill bottle which contains my daily vitamins, so when I go to Dunkin' for breakfast, I have the daily pills with me. All the pockets zip shut AND the whole thing stands up. I think that was the one thing I hated about the other purse. In spite of its design, once I got to using it, it would not stand up when I set it down on anything. If handbag manufacturers were relying on me to keep them in business, they'd be in trouble. I don't see value in a $200 purse. This bag was, with tax, $36.04. That's right. Less than $40 and I am going to use the "snot" out of it, to purloin a phrase. The straps can make the bag dangle at my hips but I prefer to tuck it under my arm so I have them doubled. The straps are an inch wide so I don't feel like accidentally slamming them in the Jeep door is going to sever them. The exterior wipes clean so when the purse swung off my shoulder and dropped onto the mud by the garbage cans last month, I just used a damp paper towel and wiped off the mud. Now, if you're wanting one of your own, this was sold by The Celtic Bag Company. The link takes you to their Facebook page. They are out of Pennsylvania which explains why I'd never seen them before. I don't imagine they go too far west. I also don't see where they sell mail order and seem to only have the Facebook page. They didn't have a huge tent, like some of the vendors at Richmond did, but, at one point, Carole and Larry had been out wandering around and said the line of people waiting to purchase bags was at least 20 people long. Bigger bags. Smaller bags. Wallets. They had them. All sorts of colors, too. I am not the kind of person who changes bags with seasons or with occasions. This is my purse, period. But, as I think back to the colors they had, I possibly could be convinced to get another purse. This kind of quality is well worth the price and having a second purse as a back up. The only problem I'm having is training myself to put everything in the same pockets every time. There's not much room for keys to disappear but the panic that arises when I can't find them because they've slipped behind the wallet is very real.